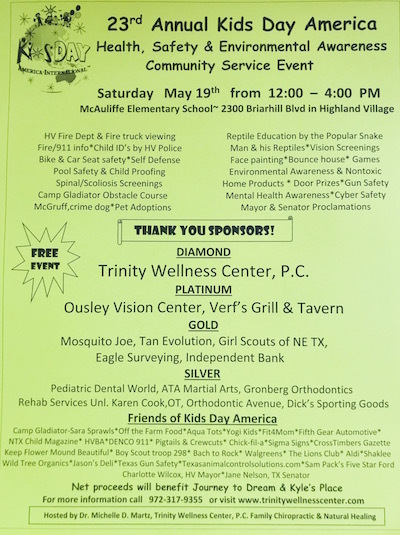 Kids Day America in Highland Village | Trinity Wellness Center, P.C. Kids Day America at Trinity Wellness Center, P.C. Join Us to Celebrate Kids Day America-International™! As a mother of five and Highland Village Chiropractor, Dr. Michelle Martz is delighted to announce Trinity Wellness Center’s participation in the 23rd Annual Kids Day America-International. Hundreds of communities are expected to participate in this historic event internationally in which 5 million children in 2,000 cities have benefitted. at McAuliffe Elementary in Highland Village. The Highland Village Police and Fire Departments also will be on-site to provide safety information for your family. Additionally, we hope to have service booths to offer education on childproofing, water safety, mental health, drug awareness, cyber safety and the importance of recycling. Bring your entire family out to enjoy an array of fun activities. These include face painting, family-friendly games and bounce houses. The famous “Snake Man,” a local outdoor education teacher and reptile educator, will be making a special appearance along with his reptiles for viewing. It’s a privilege to participate in Kids Day America-International as it will benefit two worthwhile charities. Journey to Dream provides support, resources and life skills to all children within the Lewisville ISD. Kyle’s Place offers shelter, clothing, food and transportation to homeless teens and counseling to families in crisis here in Denton County. We look forward to seeing you at the event and encourage local businesses to participate!